How to make Gluten Free Focaccia! - Sparkles in the Everyday! 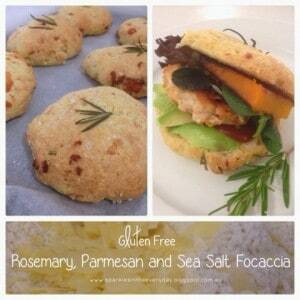 You are here: Home / Gluten Free Recipes / How to make Gluten Free Focaccia! How to make Gluten Free Focaccia! How to make Gluten Free Focaccia- the easy way! 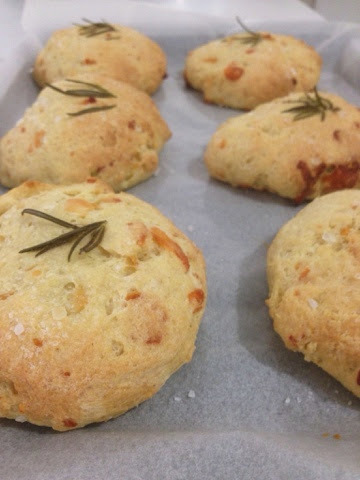 Delicious Gluten Free Focaccia that are perfect for dipping into soups, making into small pizzas or healthy homemade burgers! Friday nights in my home is ‘easy dinner’ night after everyone comes home after a busy week and we relax with an easy dinner like soup, ‘toasties’ or home made hamburgers. You know the nights when you really don’t feel like cooking much and you don’t want take-away? For our easy dinners we often make these soft, gluten free, cheesy Focaccias. They are delicious when you tear off a piece and dip it into to have a big bowl of soup, they are wonderful toasted with melted cheese and tomato but it my home, we love these gluten free Focaccias filled with avocado, a chicken patty, grilled pumpkin and make a delicious and healthy home-made burger! Being gluten free it is hard to find shop bought burger rolls that taste anything but dry …and they are very expensive especially when you need to buy for the whole family. I have tried a few versions of home made gluten free roll recipes and often find they taste either too grainy or take too long to make. 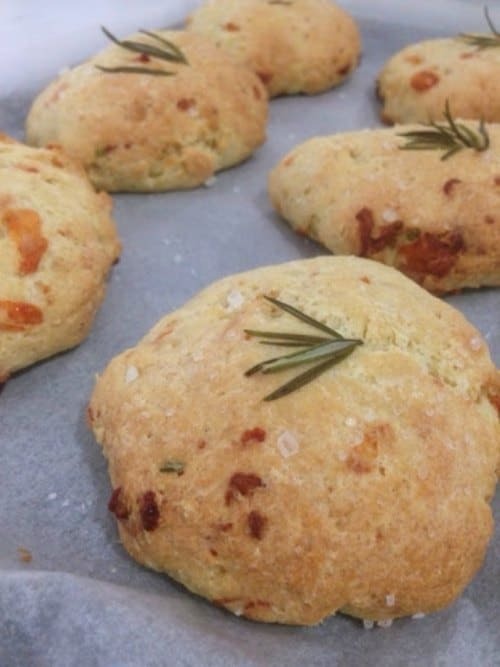 This recipe of Rosemary, Parmesan and Sea Salt Focaccias is the best! 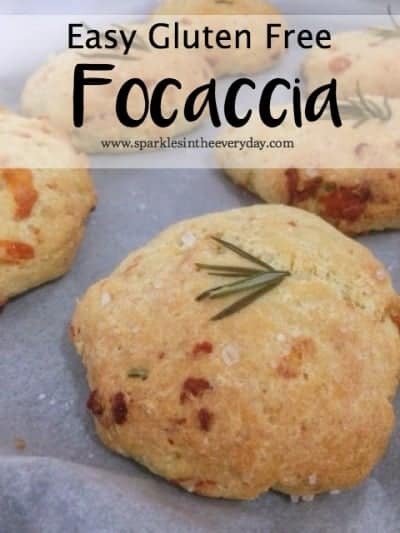 These Focaccias are gluten free and they are sooooo easy to make and I end up with 6 large burger rolls and one large one for us to gobble up straight out of the oven ….yummmm! 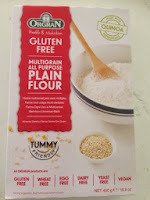 Recently, I received a sample from Orgran of their new Gluten Free Multigrain All Purpose Flour and I was really keen to see how this flour went making these Focaccias. So Friday night rolled around and we used the Orgran Multigrain flour and it was perfect!!! This flour is made with Quinoa – the super grain and I don’t want to sound like an advertisement but this flour is healthy, tastes great and made the perfect focaccia rolls!!!! 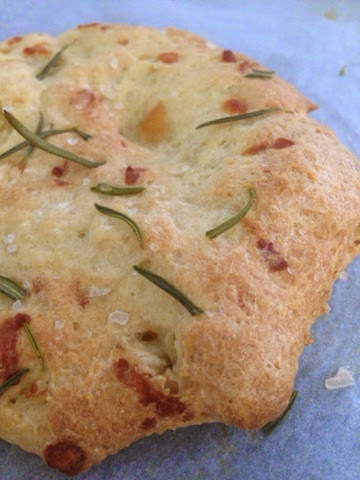 Recipe for Rosemary, Parmesan and Sea Salt Focaccia – Gluten Free !! Preheat your oven to a moderate oven – 180º Celsius (or 350 F). 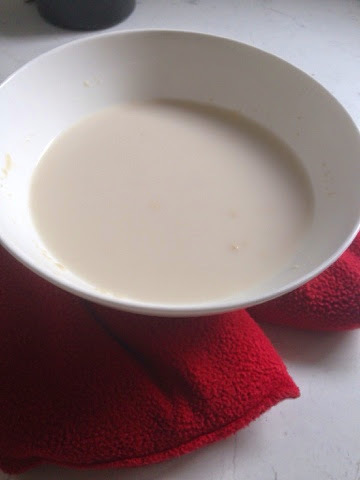 Mix together your warm almond milk, yeast and honey. Put to one side for the yeast to activate and foam up. Tip – I use a little trick of warming up my heat bag in the microwave for a minute or so and then sit the bowl of yeast mixture on top. This keeps the bowl warm to activate the yeast . Be careful not to make it too hot because having it too hot will kill the yeast and it won’t activate. In another bowl mix together GF multigrain all purpose flour, xanthan gum, baking powder, Parmesan , chopped Rosemary and salt. Then add your milk/yeast mixture (it should be foamy) plus 4 of the tablespoons of melted butter and the egg. Melt the remaining tablespoon of butter in the microwave. When it cools a bit, dip your fingers into the butter and then grab some of the bread mixture and shape it into slightly flatten rounds. 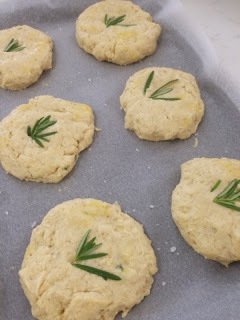 Top each Focaccia with the sea salt and Rosemary. 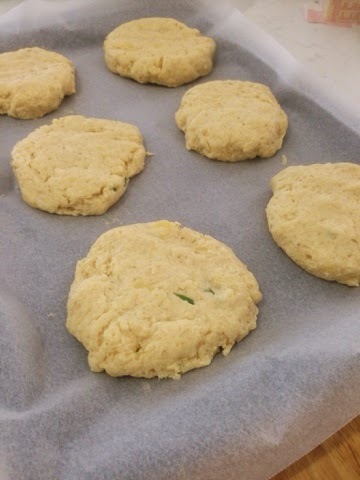 Bake for 20 mins or till they start to go slightly brown. I like to cook them till I can see the Parmesan cheese start to go brown. Remove them from the oven and enjoy them warm or made into the perfect home-made healthy burger. 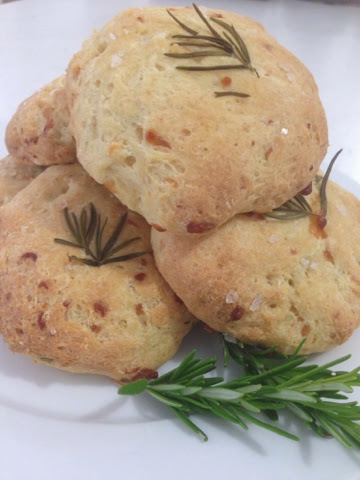 Delicious and easy to make Gluten Free Focaccia that are perfect for dipping into soups and making into small pizzas or healthy homemade burgers! Preheat your oven to a moderate oven - 180 degrees celsius. 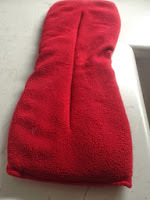 Tip - I use a little trick of warming up my heat bag in the microwave for a minute or so and then sit the bowl of yeast mixture on top. This keeps the bowl warm to activate the yeast . Be careful not to make it too hot because having it too hot will kill the yeast and it won't activate. 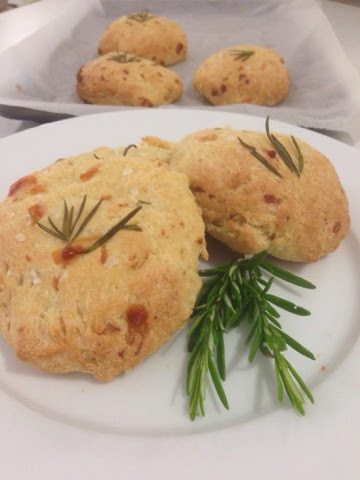 See….just perfect – delicious, soft AND Gluten Free!!!!! Knowing how to make Gluten Free Focaccia could mean that your Friday nights are easy dinners too! 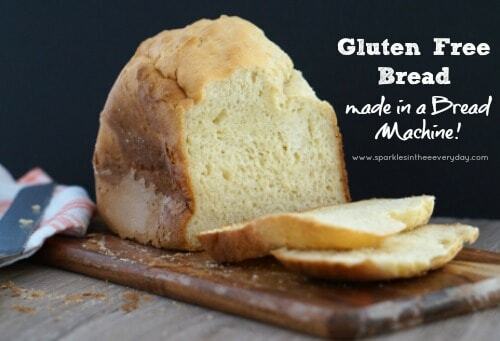 Gluten Free Bread made in a Bread Machine! « Gluten Free Baked Chicken Tenders! Yum! This looks so good. Thanks for linking up!! Looks like I can finally have a decent focaccia again and am so looking forward to trying this recipe. I have seen that brand here in Europe, but even if I cant locate that particular flour I’ll try it using an all-purpose gluten-free flour, but is your 180 temp Fahrenheit or Celsius?